Sustainable Power and Energy Center ad. Courtesy of the UC San Diego Advertising Campaign. To help ensure a low-carbon future, batteries will need to do more than charge faster, last longer and cost less — they will need to perform at the high voltages electric cars require. 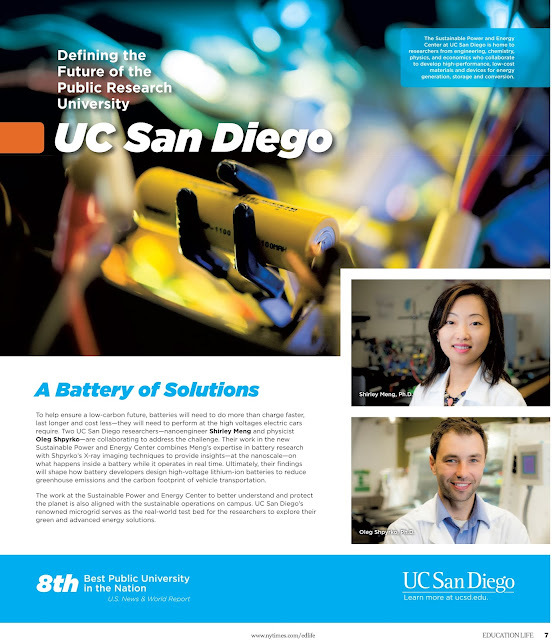 Two UC San Diego professors — nanoengineer Shirley Meng and physicist Oleg Shpyrko — are collaborating to address this challenge. Their work in the new Sustainable Power and Energy Center was promoted in a recent ad launched by the UC San Diego Advertising Campaign. The ad is one of a series of ads showcasing the high-impact work of faculty throughout the campus. The ad ran in the August 2 edition of the New York Times Education Life section. Read more about the Sustainable Power and Energy Center here.